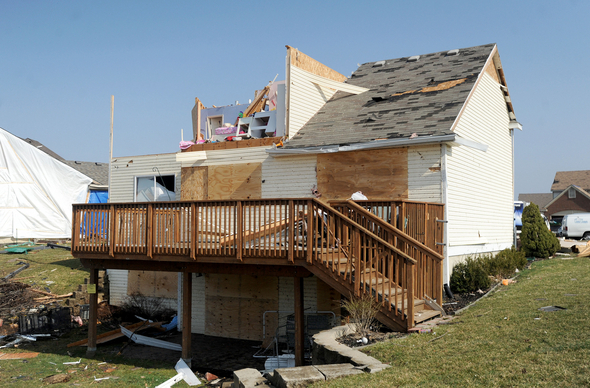 Posted on Sat, Mar 17, 2012 : 5:57 a.m.
Cleanup workers remove debris and reinforce a house damaged by a tornado that hit Huron Farms neighborhood in Dexter on Thursday, March 16. Read comprehensive AnnArbor.com coverage here. Wylie Elementary School has a number of services, including a place to shower, available for Dexter residents affected and displaced by Thursday’s tornado. In an audio message sent to Dexter Community Schools parents, Superintendent Mary Marshall said counselors, social workers and psychologists are on hand to speak with families. She said residents can use the school’s showers from 9 to 11 a.m. Saturday, and the school’s gym and pool will be open for kids to play in from 1 to 3 p.m.
Dexter Pharmacy donated hygiene products and clean towels will be available, Marshall said. All school weekend activities scheduled for Saturday are canceled, but Sunday’s activities will be decided sometime Saturday, according to Marshall’s message. Dexter resident Meg Potter and her three kids — Grant, Claire and Grace — donated clothing to the Mill Creek shelter on Friday after witnessing the tornado Thursday. Potter said schoolteachers are reaching out to their students to make sure they're OK.
"Teachers have said if your kids need to come by to see friends and have hugs just to reassure each other — they're so supportive, it's amazing," Potter said. "They sent emails to everybody." Sat, Mar 17, 2012 : 4:59 p.m.
Option A: Go to Wylie School and take a shower. Option B:tour Check into nice hotel, take a shower, watch NCAA basketball, use gym and pool, shop for new clothes. Decisions, decisions, what to do?